Portion of a papyrus codex containing Joshua and Tobit in Coptic (Sahidic). 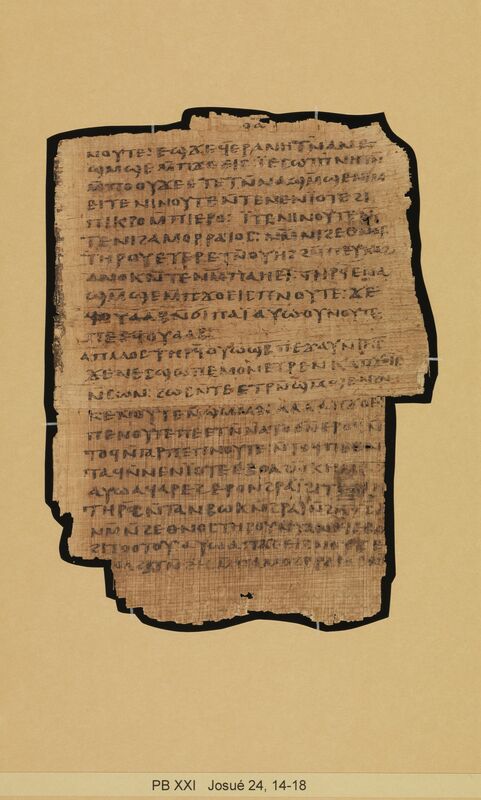 Description: P.Bodmer 21 is part of a papyrus codex containing Joshua and Tobit in Coptic (Sahidic). The portions of Joshua 6:16-25; 7:6-11:23; 22:1-2; 22:19-23:7; 23:15-24:2 are found in the Bodmer Foundation. Joshua 1:1-6:16; 6:25-7:7; 22:2-19; 23: 7-15; 24:23-33, and the final verses from the Book of Tobit are housed in the Chester Beatty Library as Ac. 1389. The title page of the codex claims that the book contains the Book of Joshua and the Book of Judith, but no known part of the book of Judith survives. The page number of the surviving folio from Tobit is only partially visible and it is not possible to determine if it was originally numbered along with the original codex or not. There are instances of tears that are repaired by a knotted loop of thread. The dialect is Sahidic with subachmimic influences. Records in the Chester Beatty Library indicate that Ac. 1389 was acquired in the summer of 1956 (Robinson, The Story of the Bodmer Papyri, 61). Presumably P.Bodmer 21 arrived in Geneva at roughly the same time. CopistesOne copyist was responsible for the bulk of the codex. Just one of the preserved pages (the last page of Joshua) is copied in a different hand. The majority hand is classified by Orsini as being a mix of the upright majuscule and inclined majuscule. The second hand he classifies in a general sense with the Biblical Majuscules but not in a strict sense (Orsini, “I papiri Bodmer,” 77). Dimensions: The width of the page is 12.5 cm. The height of the page is 18.5 cm. The ratio of the page (width/height) is 0.676. The writing is in a single column. The width of the written area is about 11.0 cm. The height of the written area is about 15.0 cm. There are 23 lines per page There are 39 extant folia. 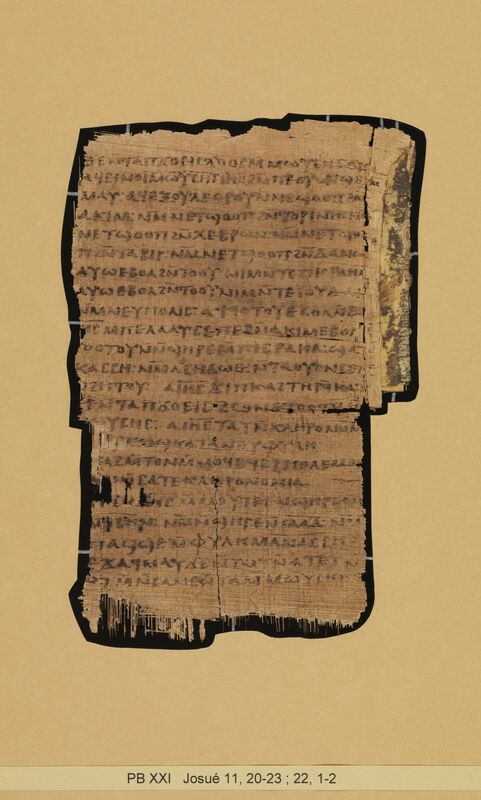 Quires: Kasser states that there are three extant quires but that the original book may have contained as many as five (Kasser, Papyrus Bodmer XXI, 7). The leaves containing pages 57-58 and 71-72 (Joshua 22: 19-26; Joshua 24:14-23 respectively) have both vertical and horizontal fibers on the same side of the page, joined together about two-thirds of the way down the page. Since these two leaves are part of the same sheet, this appears to be a fault in the original manufacture of the codex and not a later attempt to repair a torn page (Shore, Joshua I-VI, 9; Kasser, Papyrus Bodmer XXI, 9). The orientation of horizontal to vertical fibers in the rest of the codex does not follow any set pattern. Cover: The cover of P.Bodmer 21 is made of blank papyrus covered with leather and is housed in the Chester Beatty Library in Dublin. The leaf from the Book of Tobit, the preceding page and the last page of Joshua are still attached to the binding. The title “Joshua Naues” is written in ink on the outside of the cover. There are holes at the top and outside edge of the front cover to attach leather thongs to secure the book shut. Part of one of these leather thongs is still attached to the top hole. 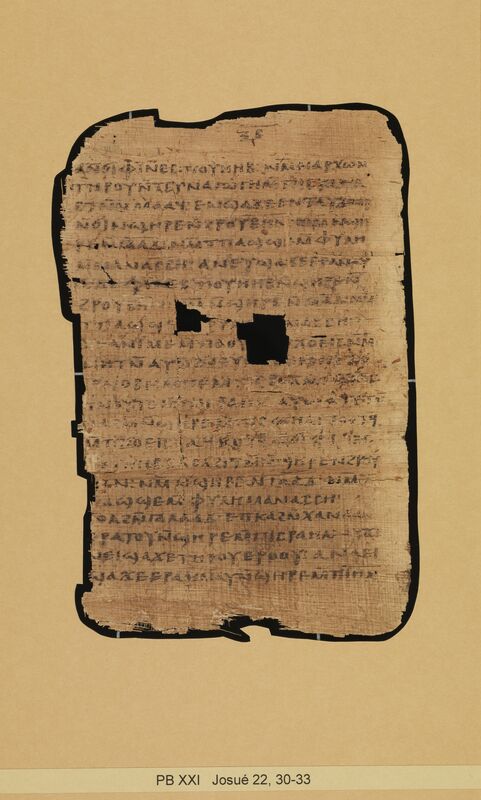 A third hole in the top right corner of the front and back cover may have served to suspend the book or perhaps to attach a marker (Shore, Joshua I-VI, 10). Binding: The quires were bound using a link-stitch at two independent pairs of sewing stations. Paratextual features: The cover of the codex says that the contents are “Joshua son of Naues”, but the inside codex title page states that the contents are “The Book of Joshua the son of Naues. The Book of Judith.” The last page of the Book of Joshua (written in a different hand) contains again the title of the Book but is undecorated. The title of the Book of Tobit appears at the end of the surviving final verses and is decorated. Decorations: A combination of diples and lines surrounds the titles of Joshua, Judith, and Tobit. Other holding institutions: Chester Beatty Library, Dublin (Ac. 1389). RésuméPortion of a papyrus codex containing Joshua and Tobit in Coptic (Sahidic). Kasser, Rodolphe. Papyrus Bodmer XXI: Josué VI,16-25, VII,6-XI,23, XXII,1-2, 19-XXIII,7, 15-XXIV,23 en sahidique. Cologny-Geneva: Bibliotheca Bodmeriana, 1963. Shore, A.F. 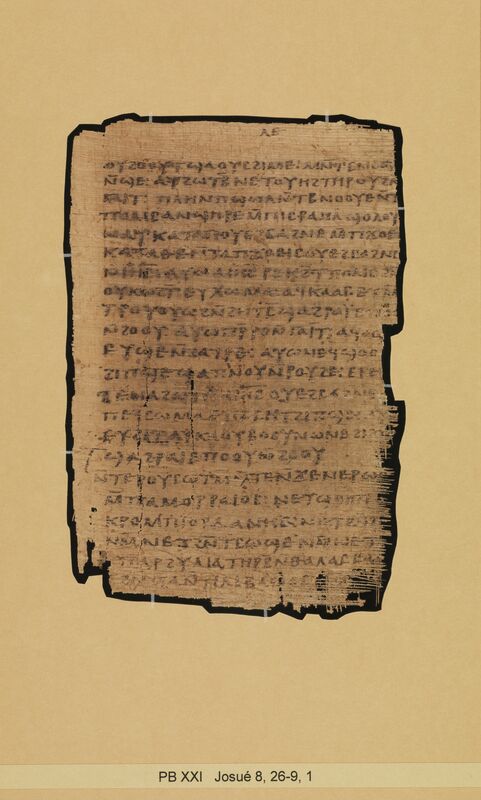 Joshua I-VI and Other Passages in Coptic: Edited from a Fourth-Century Sahidic Codex in the Chester Beatty Library, Dublin. Chester Beatty Monographs. Vol. 9; Dublin: Hodges Figgis, 1963.